While the big baby boom at church is over, there are a few of us stragglers... Melanie gave birth to a boy a couple weeks ago. 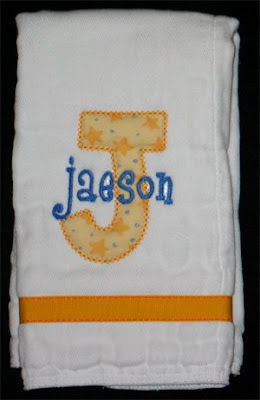 Jaeson and our son will only be a couple months apart, so that will be fun! 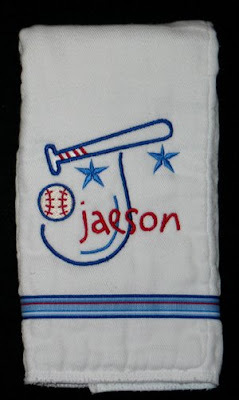 For the first burp cloth I chose Five Star Font's Baseball Monogram. I decided to go with "All-American" colors, and I love this ribbon/thread combination. 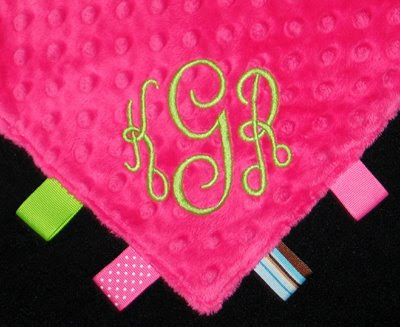 The second burp cloth is another stacked monogram. 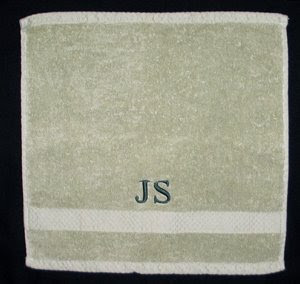 The "J" is from Embroidery Boutique's Fun Applique Monogram. His name is stitched with the Jason font from 8 Claws and a Paw. The other thing I included was a pair of pacifier clips. From what I understand they are a "house divided" so there is a garnet/gold one for when Jaeson is dressed in Seminole wear, and an orange/blue one when he's dressed in Gator wear. Tammy's granddaughter arrived safely earlier this month. 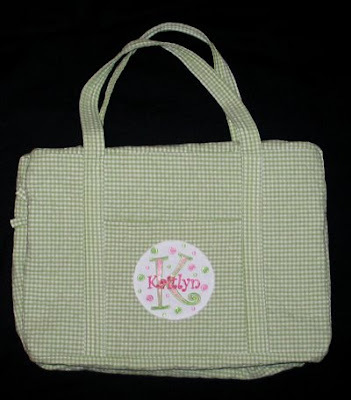 I had done some stitching for Kyleigh in the past... First the ribbon blanket and then a couple burp cloths that Michelle ordered for both mom and "Grams". 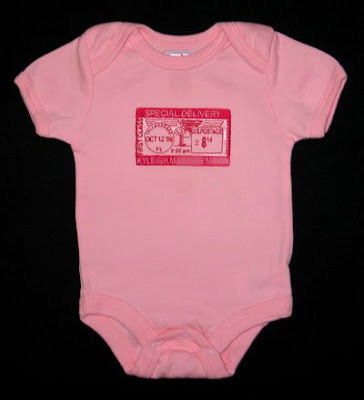 Now that we know all her stats, Tammy requested a Special Delivery Onesie. 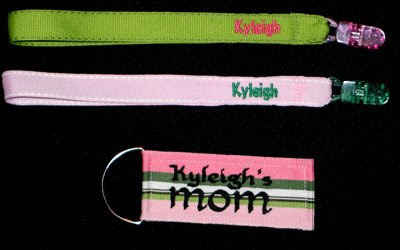 Tammy also requested a key chain and a couple pacifier clips for Kyleigh and her mom. I used Embird Alphabet #33 for the key chain and #8 for the pacifier clips. I chose bright and cheery colors to match her disposition. 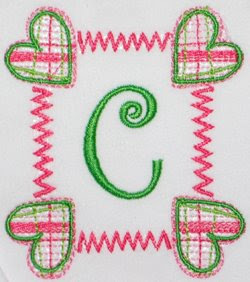 The capital S monogram is Vintage Applique Alphabet from Embroidery Boutique. I added "Susie" with the Tinker Toy alphabet from 8 Claws and a Paw. A few weeks ago friends of mine adopted a precious baby girl. I was so excited that I gave them part of their gift right away. 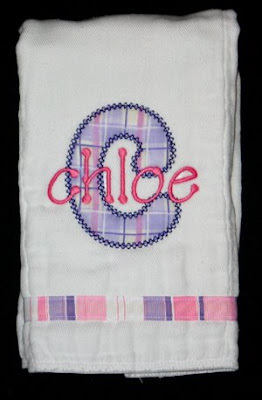 Their shower is today, and I've done lots of stitching for Chloe over the past week! First, Valerie requested a ribbon blanket. 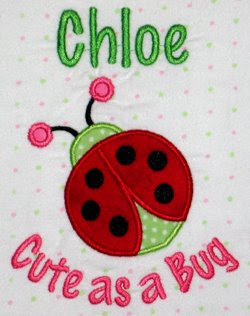 To match the Lady Bug bedding set they registered for, I used the lady bug applique design from Pegboard Crafts. I added the text with Embird Alphabet #8. 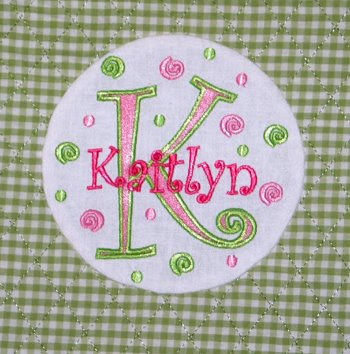 The front is a white flannel with pink and green dots. The back is a white minkee. The ribbons are an assortment of satin and grosgrain ribbons in my stash. For the onesie I used a frame from AK Designs Boutique, and I added the C with Embird Alphabet #17. 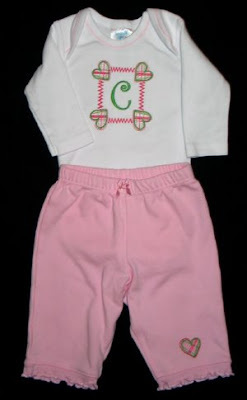 Michelle bought the little pants and I embroidered a heart from the frame onto the pant leg to make a matching set. For the burp cloth Michelle wanted something for daddy to use, so I stitched "Daddy's Little Girl" with Alphabet #38, and added paisley designs (from another frame from AK Designs Boutique) to go with the ribbon. 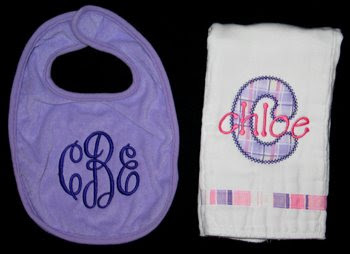 See, in anticipation of orders I had come up with lots of monogram options for people to choose from, and I fell in love Chloe's monogram in the Empire font from Embroidery Arts. It just HAD to be stitched! I picked her mommy's favorite color for the bib. I've also be anxious to try this fabric/ribbon combination. 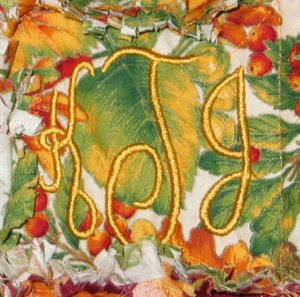 The monogram is Vintage Applique Alphabet from Embroidery Boutique. I added her name with Tinker Toy alphabet from 8 Claws and a Paw. 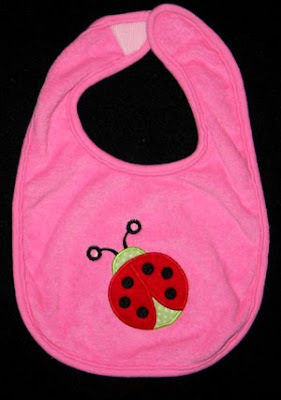 Michelle requested a burp cloth for a baby shower. She sent me the link to their registry, and the parents had picked a sage & brown bedding set. 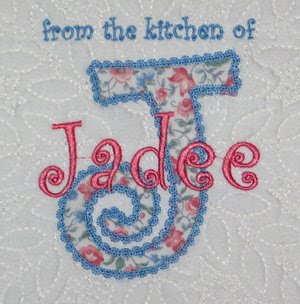 Michelle indulged me and let me try a new monogram font I have been anxious to try -- Scrappy Applique Font from Five Star Fonts. 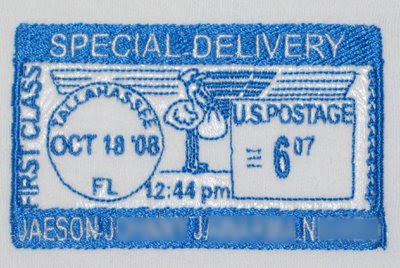 It has seven fabric patches with a neat stitching between them. Imagine all the possibilites depending on your fabric selection!! 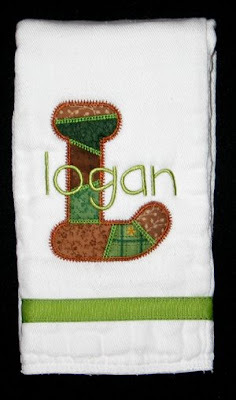 For the name Logan, I used the stacked font that came with the Diploma Monogram Font. Our little friend Kylie turned one today. When I asked mommy if she had any gift requests, she mentioned that she'd be taking Kylie to her first FAMU homecoming game soon. 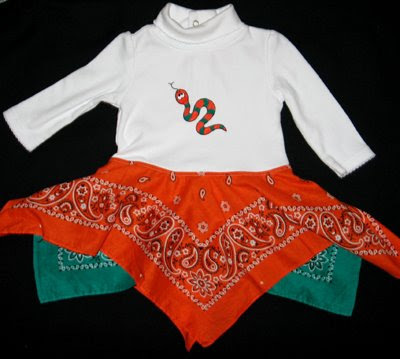 I knew right away what I wanted to do... an orange and green bandana dress. 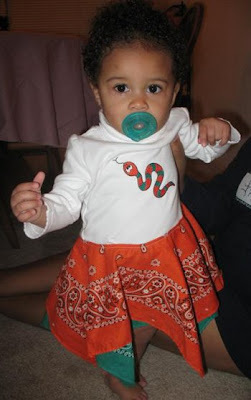 I embroidered the turtleneck onesie with a snake design from Designs by JuJu (a freebie on her yahoo group), and then added the bandanas to make the skirt. Owl Shirt for "theme of the week"
So I have created a monster. I've made reference to this monster before, but last week she appeared again. For Annaliese's birthday Grandma Kathy sent her several pair of striped leggings that she can wear this fall. 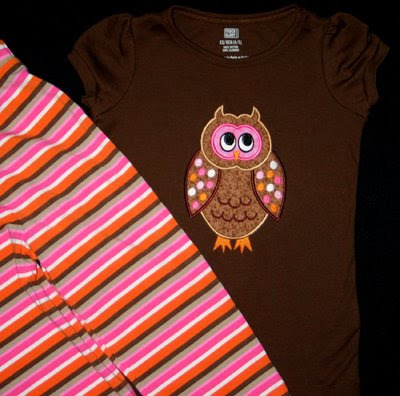 So I grabbed a pair of those and went on a hunt to find an owl design and the right color shirt/fabric to make her an owl shirt. The applique owl I picked is from Embroidery Boutique. I'm pretty pleased with the results. Annaliese thinks it's really cute, so that's what is important. This evening I made an item to donate to the MOMS Club open house. 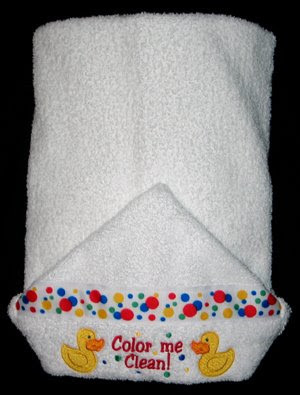 I decided to make a hooded towel, as I did last year. I chose the same gender neutral design, but changed the colors to coordinate with the fun ribbon I had in my stash. 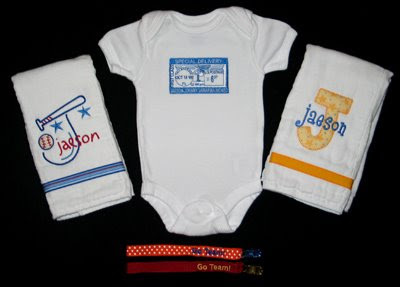 The designs are from a "Fun in the Tub" design set on Sew Forum (no longer available). Marcy is Angie's friend, and after she saw Hagan in his Special Delivery Onesie, she contacted me about making one for her daughter. 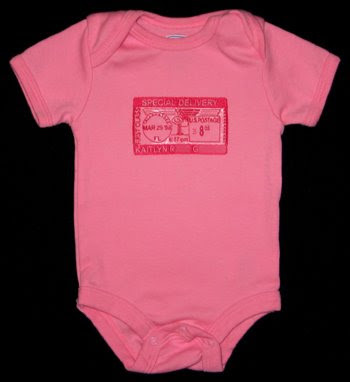 So first up is her Special Delivery Onesie (design from Sew Terific). 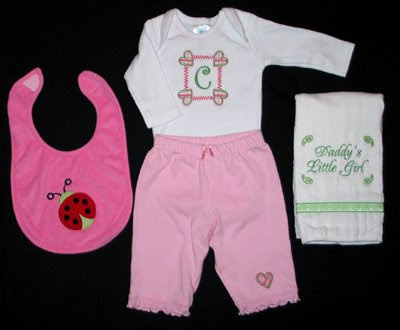 Marcy also asked me to monogram some items she already had. 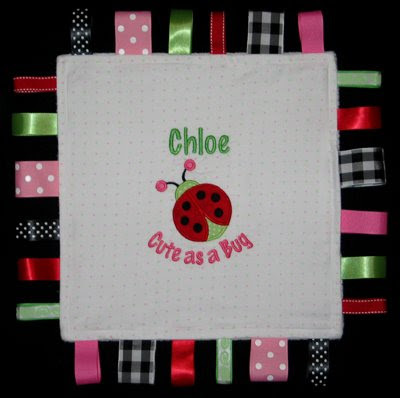 She has started making burp cloths by adding ribbon and fabric (the are all so cute! 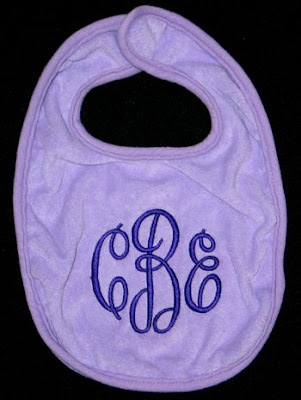 ), but she also wants them monogrammed. 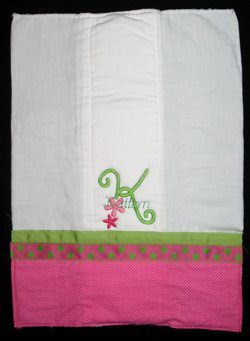 For this one she picked the Flower Power monogram from Julia's Needle Design. 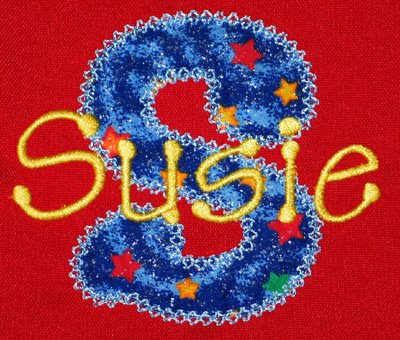 I added her name with the Rumba font from Sew Crazie Designs. 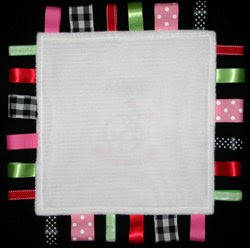 Next was a ribbon blanket that she had purchased, maybe at a craft show? 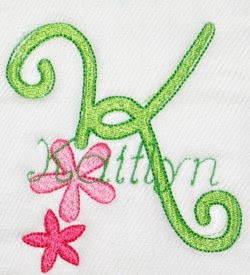 Anyway, I added her monogram with my new Empire Monogram Font from Embroidery Arts. Finally, Marcy brought me this awesome bag that she had bought for... are you ready for this? ONE DOLLAR at a Pottery Barn Outlet. 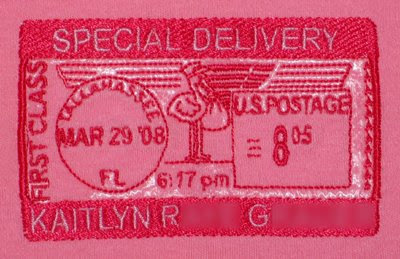 It was already monogrammed, which I guess is why it was so cheap. 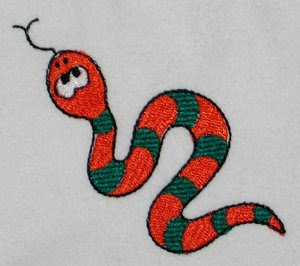 She and her family had done an amazing job picking out the stitches... but the way the pocket was attached, there was no way I could hoop it and stitch a monogram on it without closing the pocket. So instead I did a monogram patch, using the same technique described in this post. 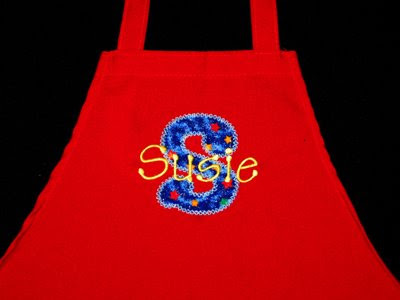 The monogram is Embellished Curlz, also from Sew Crazie Designs. New Fall Purse for me! 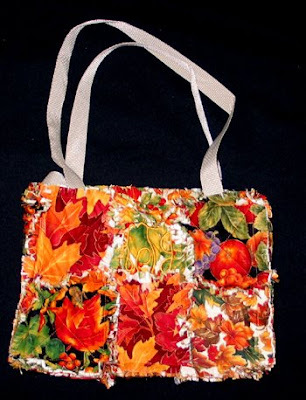 Last year I made myself a rag bag out of Christmas fabrics I had bought years ago. At that same time I also purchased fall fabrics, and over the course of the last week or so I finally made myself a new bag to carry through Thanksgiving. I added my monogram to this bag. It's pretty subtle with all the colors in the fabrics, but I think it turned out pretty. (Yes, that is my monogram... Janay is my middle name.) The font is one I've been wanting for a LONG time, but rather pricey. Recently it was on sale 30% off, so I decided to go ahead and get it. 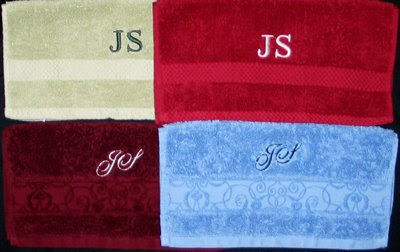 It's a beautiful monogram option I can now offer and I'm sure will be used lots. 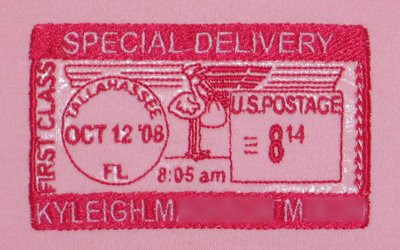 It's called Empire Monogram Font from Embroidery Arts. 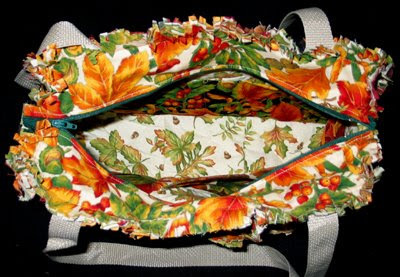 Here's a quick peak inside... it has pockets of various sizes all around the perimeter, just like my Christmas bag (you can see more details at that post). 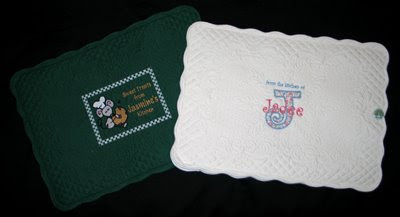 Lou contacted me about monogramming some face cloths for her. She likes to leave one on the pulpit for her minister each service, and thought it would be a nice touch to add his initials. For this first order I did four. Originally Lou selected Embird Alphabet #38 for his initials. 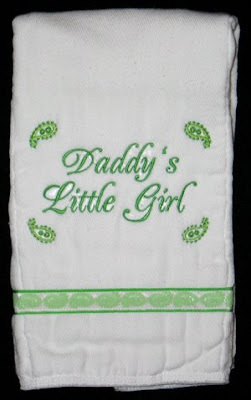 I stitched that on two of the washcloths because it really looked nice with the design already on the cloth. 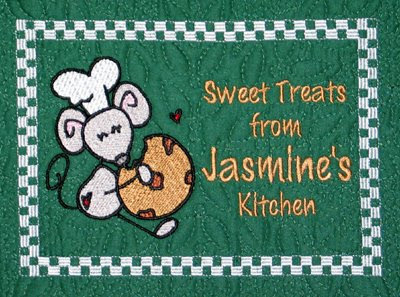 But because it's a thinner font and these were pretty plush cloths, the embroidery got lost. I made an executive decision to switch to Embird Alphabet #16 for the other two. While much more plain, they definitely stand out better.